In 1983, president Ronald Reagan shocked the world when he announced that the United States was developing an ultra-modern defense system against intercontinental ballistic missiles. Hundreds of billions of dollars were invested in the system’s development – But then, in 1991, the Soviet Union collapsed, and with it – the Star Wars initiative. Was Reagan’s Strategic Defense Initiative the reason for the Soviet Union’s collapse? Soon after World War 2 ended, a new military tension started to grow between the US and the Soviet Union – it was known as The Cold War. As early as the 1950s and 60s, each of the superpowers had enough nuclear bombs to turn its enemy into radioactive dust. In fact, they had enough bombs to destroy all of the human civilization. In 1983, president Ronald Reagan shocked the world when he announced that the United States was developing an ultra-modern defense system against intercontinental ballistic missiles, which would be able to stop any surprise Soviet nuclear attack. This system was named SDI – Strategic Defense Initiative – and was so sophisticated and technologically advanced, that it soon came to be known as “Star Wars”, after the famous fictional movie series. Hundreds of billions of dollars were invested in the system’s development. But then, in 1991, the Soviet Union collapsed, and with it – the Star Wars initiative. In this episode we’ll try to answer a question that many historians have debated over the past twenty years: was Reagan’s Strategic Defense Initiative the reason for the Soviet Union’s collapse? Some cynics said that Reagan was still thinking like someone from Hollywood, to propose an idea like this, but in truth, Reagan wanted to avoid Nuclear Armageddon. He wanted to save the world. And since he couldn’t make the Soviet missiles just disappear – an expensive defense system seemed to be the only sane option. How can one go to about designing such a defense system? Well, the short lifespan of an intercontinental ballistic missile includes three typical stages: launch, the flight in outer space – and re-entry back into the atmosphere. The launch stage is the only stage where the missile is actively guided; after that, it travels in an arcing ‘ballistic’ trajectory until it reaches its target. There’s no doubt that technically, it’s easiest to destroy a ballistic missile during launch. In takeoff, the missile is traveling relatively slowly and the rocket’s engine gives off heat that makes it easily detectable. An aircraft with a suitable weapon could easily take down a missile. The problem is, of course, how do you place an aircraft within striking distance during the missile’s launch – and in the case of the distant Soviet Union, this was never a viable option. The Soviets, as well as the Americans, had submarines that were able to launch ballistic missiles in complete surprise. Another option was to destroy the missile during re-entry, as it returns to the atmosphere. This option has the advantage of knowing exactly where the missile is going to since one can guess which cities the Soviets would target. An anti-missile defense system could just sit in one place, and wait for the missile to make its way to it. However, intercepting a ballistic missile in re-entry is a complicated technical challenge. You’ve got to realize that the warhead dives to the ground at several times the speed of sound, and the interception time window is only about 30 seconds long! The missile has to be intercepted at a high enough altitude so that if a nuclear explosion occurs due to the interception, the city below will not be affected. Furthermore, the defense system has to be 100% reliable, since there will be no second chance at an interception. In fact, in the 1960s the United States had two such short-range anti-ballistic missiles: the Sprint and the HiBex. Both missiles were amazingly advanced for their time. In the case of a nuclear attack, the Sprint was to be launched first. A controlled explosion blew off the missile silo’s cover, and a second explosion drove a piston that pushed the missile forward with such force, that the Sprint actually broke the speed of sound even before it left the launcher. Strong rockets hurried the missile to Mach 5 within less than five seconds, and on contact with its target, the Sprint detonated a Neutron bomb, which is a kind of a low-yield thermonuclear weapon. 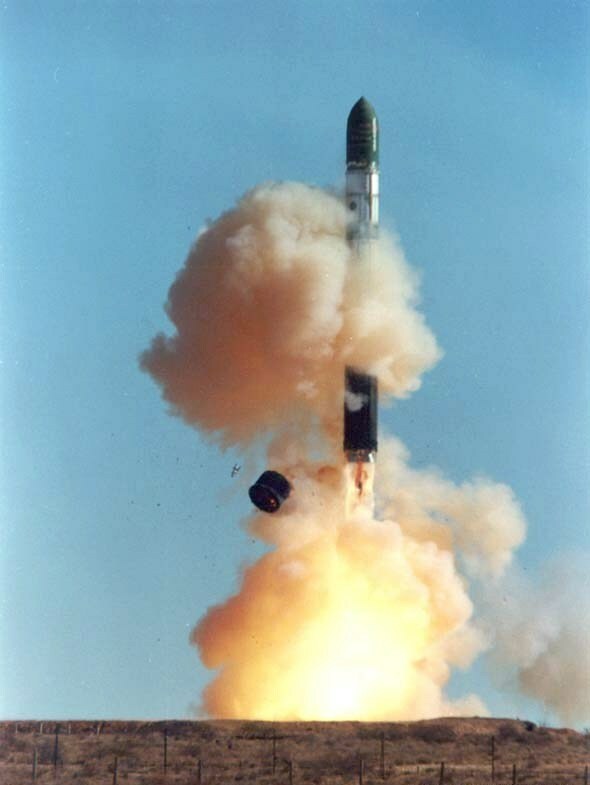 If the Sprint failed to intercept the incoming missile, then the HiBex (short for “High G-Boost Experiment”) was supposed to leave its launcher within less than a quarter of a second, and intercept the bomb just four miles above the ground: a distance that a ballistic missile makes in just two seconds. As you can imagine, planning a rocket missile like that wasn’t a simple matter, to say the least. Its electronics and mechanics had to stand acceleration of hundreds G-forces and even simple tasks, like changing flight direction, became almost impossible. Every feature of the missiles had to be designed in order to withstand the impossible conditions – and on top of that, don’t forget that the Sprint had a nuclear warhead, too. The Sprint and the HiBex were so expensive and cumbersome to operate that the plan was canceled within a few years. So the next option was to intercept an attacking missile outside the atmosphere, where it spends most of its flight time. This is far from an easy task – but at the time, it seemed easier than the other two options and so it became the focus of Reagan’s Initiative. A system of sensors and sophisticated weapons that were launched to outer space at a short notice would have – at least on paper – several minutes to handle any approaching missiles, which is better than the seconds the Sprint and HiBex missiles had. But Reagan’s plan came under attack from the moment it was announced – mostly because it was clear that the program would cost the American taxpayer trillions of dollars. Its supporters responded by saying that in the case of a nuclear holocaust there wouldn’t be any American taxpayers left. Basically, no cost was too great to save humanity. Putting aside the funding concerns, there was still the question of feasibility. Some experts claimed that placing such a complicated array of sensors outside the atmosphere was impossible, given the technology available at the time. In fact, the nickname “Star Wars” wasn’t given to SDI as a compliment: a critic came up with the name as a way to ridicule the program as no more than a fictional fantasy. And SDI was as ambitious as it gets. For example, one of the early ideas was to use x-ray lasers to destroy the enemy’s missiles. Laser, as any diehard science–fiction fan knows, is an ideal weapon to use in space since it moves at the speed of light and there’s no atmosphere to scatter the beam. However, to make a strong laser that could take down a warhead, you need a powerful source of energy. Scientists like Edward Teller – known as the “father” of the Hydrogen bomb – suggested detonating an atomic bomb in space, and focusing the vast amounts of x-ray photons created in the explosion into dozens or even hundreds of powerful lasers that would only be active for a few fractions of a second before being vaporized – but that should be enough to destroy any missiles around them. Unfortunately, designing such a weapon and especially testing it proved to be too difficult. Another idea was the ‘Rail Gun’, a concept well-known by gamers and sci-fi fans. 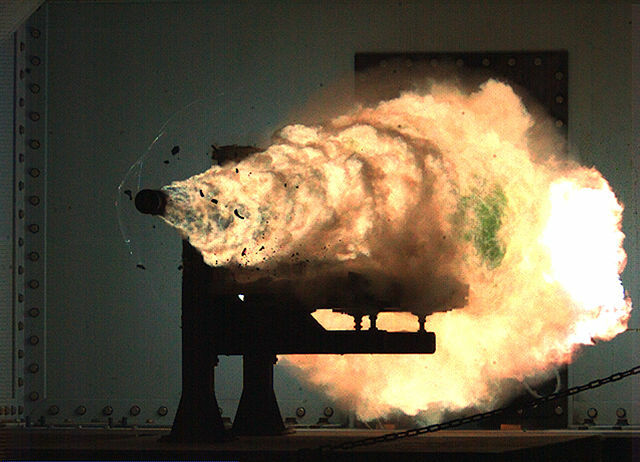 The Rail Gun fires a bullet at an extremely high velocity, a few dozen miles per second. At such fast speeds, a bullet has so much kinetic energy that there’s no need to add any explosives to it: a piece of metal weighing one kilo – roughly two pounds – moving at a speed of about 5 miles per second, would hit a target with a force of ten kilos of TNT. And since Rail Gun bullets don’t need explosives – they are lighter and safer to store than regular shells. Alas, accelerating a bullet to such high speeds is impossible using ordinary chemical explosives, like the ones found in tank shells. A possible solution is to create a powerful magnetic field that propels the bullet forward at high speed – But once again, it’s not feasible. The electric currents needed to create such powerful fields can reach up to half a million amperes – which is enough to melt the rails the bullets would be traveling on. At the peak of this project, engineers were able to launch two bullets a day, but they found it difficult to aim the gun in a way that it would hit small, distant targets. These last two examples demonstrate how complicated the technological challenges were that the United States faced in order to make Reagan’s dream come true; remember, this is all during the era of the Commodore computer, VCR, and double-cassette tape recorder… And of course, the Russians didn’t just sit back and watch: Their scientists were no less brilliant than their American colleagues, and there’s no doubt that they would have found ways to deceive the American defense system. In fact, all the Soviets had to do was to double, triple, or quadruple the number of ballistic missiles they had. Eventually, the defense system would reach the end of its capacity and some missiles would make it to their targets. It’s no wonder, then, that many critics claimed that SDI was a complete waste of money. Reagan’s Cold War troubles didn’t end there. When Western European politicians first heard about the Strategic Defense Initiative – they dismissed it as no more than an election “spin.” But when they realized that Reagan was serious, France, West Germany, and England put considerable pressure on the US president to cancel – or at least moderate – the initiative. On the surface, this seems weird. After all, SDI was supposed to prevent a global nuclear holocaust. Why oppose it? The answer has to do with the defense strategy used by the both the US and the Soviet Union. It had a very catchy name: MAD, which stands for Mutual Assured Destruction. In simple words, each of the superpowers had enough ballistic missiles, aircraft and submarines to annihilate the other side. That is to say, if one morning the United States decided, for whatever reason, to attack the Soviet Union – The Soviets would launch their missiles and both countries would become a radioactive wilderness. That’s Mutual Assured Destruction. And maybe it was also called MAD because it was mad! The two superpowers held loaded guns at each other’s heads, and in the case of a nuclear war, not only the American and the Soviet citizens would pay the price, but the entire world would suffer. This stable balance is the reason why, paradoxically, both superpowers refrained from interrupting each other’s recon satellite activity. These satellites made sure that each side could see that the other side wasn’t getting ready to attack – and so a war would not start accidentally. In fact, the United States and the Soviet Union signed an agreement in 1973 that forbade either of them to develop a defense system against intercontinental ballistic missiles – a system like the one Reagan had in mind. The Western Europeans were relatively content – with that balance. And then, all of a sudden, President Ronald Reagan decided to set a defense system in space (of all places! ), that would totally destabilize that precious balance. Who knew what could happen next! The Soviet might panic and decide to strike the US, a moment before Star Wars became operational. And the Europeans? They would be on the losing side, mainly since there wouldn’t be any other side. But Reagan wasn’t content with the MAD strategy and wasn’t willing to depend on it as a long-term solution. He had a strong argument against it. Basically, the MAD strategy assumes that both sides behave rationally, and out of self-preservation. But what if – just like in a James Bond movie – terrorists, or a radical third-party like Iran or North Korea, decide to launch a nuclear attack – and make it seem as if one of the superpowers was behind it? And of course, there’s always the possibility of a technical malfunction – a false alarm in an alert system, for example – that could push the world to the brink of extinction… and there were a few false alarms like that during the Cold War. MAD was too precarious. As far as Reagan was concerned, it was a strategy he was willing to employ only as long as he had no other choice – and now, he had one. With a lot of effort, President Reagan talked his allies into accepting his plan. He also had a significant ‘carrot’: the development of such an ambitious system would require the involvement of almost all the major global military industries – many of which were European. So in spite of all the criticism and objections, the SDI development program was launched in 1984. It is estimated that its total cost was several hundred billion dollars. So now is the time to go back to the question we asked at the beginning of this episode: could it be that the resources the Soviets invested in countering the American initiative were the reason for the fall of the Soviet Union in 1991? There is no doubt that the Soviets were not big fans of the Strategic Defense Initiative, to say the least. Mikhail Gorbachev, the Soviet Union’s leader, kept trying to persuade Reagan to give it up – and he was willing to go above and beyond in order for the initiative to be canceled. For example, when the two met in Iceland, in 1986, Gorbachev agreed to significant cuts in the superpower’s nuclear arsenal: it would have been the biggest concession made by the Soviets in twenty-five years! He was even willing to destroy all the ballistic missiles of both superpowers – all of them! – if only Reagan would freeze the Star Wars initiative. But Reagan refused. He was so invested in the initiative, he even offered to give a copy of the defense system to Gorbachev and the Soviet Union when it was complete. Gorbachev thought the idea too absurd and rejected it. In 1991, the Soviet Union collapsed. Some American officials and commentators, like Robert Gates, head of the CIA – believed that it was SDI that caused the Soviet economy to fail. This theory is known as “the Red Queen Hypothesis.” It comes from Alice in Wonderland and refers to the scene where Alice and the red queen run hand-in-hand, but are not moving at all. The queen then tells Alice that in her land one must run as fast as possible – just in order to stay in the same place. Many in the US believed that, much like the Red Queen in Alice in Wonderland, the Soviet Union invested significant amounts of money and resources – only to keep up with the USA’s military and technological advantage. This investment was so demanding, that it did for the USSR what fifty years of Cold War couldn’t. But modern historians agree that SDI had nothing to do with the fall of the Soviet Union. In fact, many historians claim that senior Soviet scientists were in agreement, much like many of their Western counterparts, that SDI would fail. Therefore, the Soviets never announced an initiative of their own and didn’t invest any resources in it. So why DID the USSR economy collapse? Well, it seems that its troubles began back in the 1970s – long before Reagan became president. Firstly, the Soviet industry was lagging far behind that of the Western world, and computers were never widely used. Secondly – the war in Afghanistan cost a fortune, and third, the Soviet economy was based mainly on oil exports, and oil prices were very low throughout the 1980s. In other words, the menacing and powerful-looking Soviet industrial machine – was, in reality, a sham, and the Soviet economy was on its way to oblivion for a long time before SDI. But SDI might have had a more subtle impact on the USSR. Gorbachev and his liberal colleagues in the Soviet leadership were aware of the deep financial trouble the country was in. They tried to encourage the conservative elements of the army and the party to abandon the costly and wasteful arms race. Their logic was – why would you need twenty thousand intercontinental ballistic missiles if two thousand are more than enough? But the Strategic Defense initiative dropped the ground out from beneath their argument. If SDI would be successful, then two thousand missiles would not be enough to do the job – and perhaps not even twenty thousand would! Reagan’s initiative allowed the conservatives to maintain their argument and resist any defense budget cuts – especially after Reagan called the Soviet Union “The Evil Empire.” And so Gorbachev and his allies failed in pulling the USSR’s economy from the mire it was in. In other words – the SDI probably didn’t cause the Soviet Union’s collapse, but it might have made it harder for the Soviets to escape it. But ironically enough, the death of the Soviet Union meant the death of the Strategic Defense Initiative. The Cold War was over, and slowly but surely the next administrations dismantled Reagan’s grandiose plan; it was ultimately replaced with smaller defense system programs against short-range missiles, rather than ballistic ones. Here and there the Star Wars Initiative contributed to research on various topics. Research into lasers, for example, got a big boost. Astronomers, in particular, profited greatly from it. Earth-based telescopes have an inherent limitation: the light from stars is consistently diverted by movements of air in the atmosphere, and this makes images blurry. This same problem affects the performance of laser weapons as well, and so a lot of effort was invested in minimizing the effects of air turbulence. This research resulted in a technology now called “adaptive optics” which is being used in many telescopes. Before the actual exposure of the telescope, a laser beam is sent in the same direction the telescope is pointed at. Calculating the effects of air turbulence on that laser allows the computer to adjust the lens of the telescope to counter them, and so get a sharper image. But putting these relatively minor benefits aside, it’s hard to justify the huge financial investment in SDI. Who knows – if those same hundreds of billions of dollars were spent on medical research, we might have a cure for cancer today. If there’s one thing we can learn from the failure of the Strategic Defense Initiative, it’s that even superpowers cannot resist the forces of history. The Soviet Union collapsed due to long historical processes, and not due to Reagan’s efforts. The Star Wars initiative didn’t take off even though it had all the US economic, political and cultural might behind it. In other words, a bit of humility can never hurt.